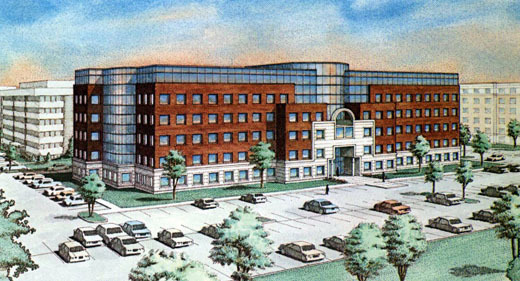 Randal was retained by a real estate development company in Chicago called Walsh-Higgins, to render a proposed office building to be located next to the Walgreens headquarters in the northern suburbs of Chicago. The architectural design blueprint drawings were provided. Randal first created a 3D wireframe model of the building on his Mac using a 3D modeling software. The final perspective view was transferred to watercolor board and then inked by hand using sepia ink in Rapidograph pens. The final step was to add Windsor & Newton watercolor washes to the bring out color, forms, tone, and texture. The finished art was 20 x 30 inches and was drum scanned for 4-color offset printing plates and reproduction.